This was a tacky polyester mens shirt I got thrifting. 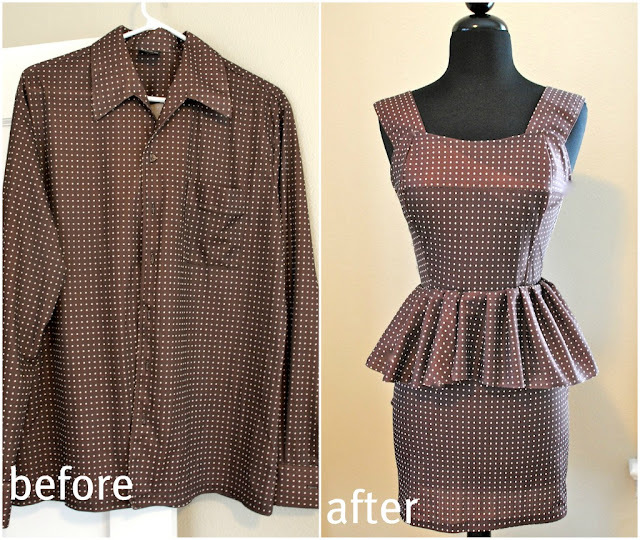 I loved the brown/polkadot fabric and thought a peplum would be a nice twist to the mens shirt refashion. I made my own pattern for this dress. You can use your favorite dress to draft patterns (just trace and cut using newspaper...). Oh my god that is actually amazing!! I'm always so amazed of how you can turn something ordinary into something beautiful! Is there any way you could make a pattern that I could print off? I have been looking for this dress pattern for months. Wow! How did you do that!?! It's incredibly beautiful! If I had a sewing machine my boyfriend's shirts would be in trouble! Great job!! would love to do this too! does somebody knows where can i find a pattern? I simply can't believe the awesome projects you do! You are so talented! I wish I could sew like you do! I am totally in love with that dress.....you rock! Question.....where did you get your dress form? What brand? Thanks!! I got it from ebay years ago...check for some online. That is one HOT reconstruction ! What size shirt did you use ? Is the dress lined ? Oh my gosh, that is adorable! Thank you for the how-to! Beautiful job! i like it! Oh, may I ask ... shirt was originally a large? Love, love, LOVE this! Finally found a refashion that doesn't LOOK like a refashion. Kudos to you, I'll be following you now. My mind is officially blown! I have to try this, even if it means immediately cannibalizing my husband's shirts. :) Thank you so much for sharing!! I am totally in love with that dress. love to do this too! does somebody knows where can i find a pattern? Is the bodice and skirt one piece? May I ask what size was the mens shirt and what size did you make your dress into? The mens shirt was an XL and sewing into a small. Love, I'm going to DIY it! just curious if the back of the dress has a zipper or if it's all one piece you slip into? 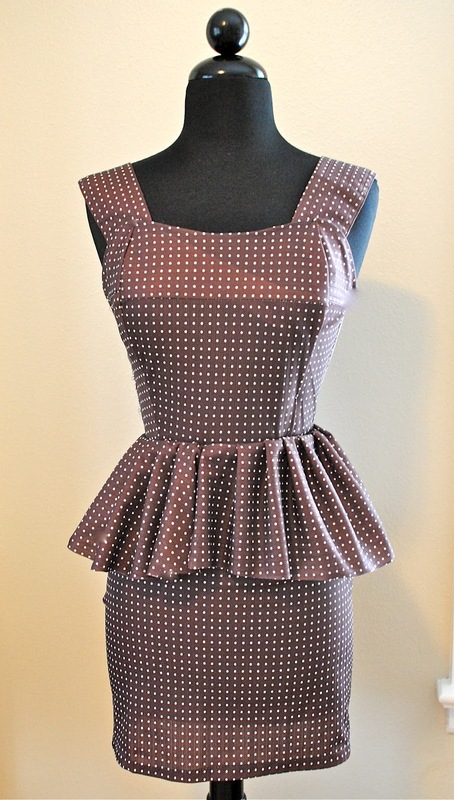 i want to make a dress like this but with this type of material i didn't think it would stretch easy enough so to speak so that's why i was wondering what the back of yours looks like or how it's made. what does the back of your dress look like? does it have a zipper or is it all one piece you slip into? due to the type of fabric idt it would stretch easily so i'm just wondering bc i want to make this type of dress. This is great !!!! You are clever ! Congratulations on this beautiful dress ! Very interesting, Embroidery Packs good job and thanks for sharing such a good blog. Well you describe it, you are absolutely right.